During the 80th anniversary of the Spanish Civil War in 2016, the International Brigades Memorial Trust asked that areas which have a memorial or plaque to commemorate it by laying a flower or a wreath. The government's last ditch attempt to bribe enough Labour MPs to back Theresa May's Brexit deal has seemingly backfired - with only a few Blairites prepared to back her. More than 150 trade unionists and activists rallied to Hull and District trade union council's call to defend the transport union RMT's picket line on 26 January. Far-right protesters, wearing yellow vests, verbally abused the RMT transport union picket line at Manchester Victoria station on 5 January. Ferrybridge workers on construction sites and fast food factories have stuck two fingers up at the Tory Trade Union Act by striking. Lecturers across Wales will be taking strike action over pay and workload on 4 and 13-14 December. This follows the fantastic ballot result of University and College Union (UCU) members who voted overwhelmingly to strike. 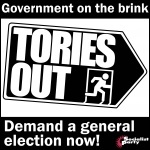 Tories Out! General election Now! Theresa May's government is on the brink. This morning the resignations began. Around 8,500 working class women in Glasgow made history through their strike.